Readings in the press on Open_Source_Art_Hack. What you won't find at this show are works that involve computerized breaking and entering. These "hackers" operate more tactically. Besides addressing themes of surveillance and code transparency (the death of the author updated as the death of the programmer), many projects don witty veneers that give way to open-ended systems. Cue Jack, by Cue P. Doll in collaboration with distributor ��ark, plugs into at-home bar-code scanner CueCat to provide data outside the marketing plan (regarding environmental viability, safety recalls, and so on) instead of retrieving sanctioned product details. Its creator aims to erode imbalances of information between individuals and corporations. "Information capital," she says, is "infinitely copyable." Merging product (re)design, programming, and entertainment, "Open_Source_Art_Hack" will show socially conscious Internet art holding its own in the agitprop tradition." �Rachel Greene, Artforum, May 2002. NEW YORK -- Hacking has been described as a crime, a compulsion, an often troublesome end result of insatiable curiosity run amok. Rarely has anyone who is not a hacker attempted to portray the creation, exploration and subversion of technology as a valid and elegantly creative art form. But Open_Source_Art_Hack, a new show opening Friday at Manhattan's New Museum of Contemporary Art, attempts to show how the act of hacking and the ethics of open-source development -� direct participation, deep investigation and access to information -� can be art. Each piece and performance features technology altered by an artist-geek with an activist attitude, something that the curators of the show refer to as "hacking as an extreme art practice." "Originally the word 'hacker,' as coined at MIT in the 1960s, simply connoted a computer virtuoso," said Jenny Marketou, a new media artist and co-curator of Art_Hack. "Now hacking means reappropriating, reforming and regenerating not only systems and processes but also culture." Art created with open-source ethics in mind allows artists to become providers of more than pretty pictures. They can produce functional tools that they and others can then use to create new art forms, said museum director [sic] Anne Barlow. "And given the nature of open source, the process can be as important as the end product," Barlow said. Process -- how the art was created and how it can evolve -- is one of the key focal points of the show. Activism -- using art and hacking to tweak a system or totally sabotage it -- is the other primary focus. In this show, it doesn't matter much how the art looks. What matters is what the artist and others can do with it and learn from it. "I have come to think of hacking as a process involving a combination of information dissemination, direct action, skills and creative solutions," Marketou said. "Hacking is an important phenomenon and a metaphor for how we digitally manipulate and think our way through the networked culture that engulfs us." "I am interested in ways that artists misuse technology, use it for other than its intended or sanctioned purposes," said Steve Dietz, curator of new media at the Walker Art Center, and co-curator of Art_Hack. "This sort of transformation appears to be a common if not fundamental aspect of any artistic use of technology, including coding and hacking." "Due to the nature of the show, I had the opportunity to challenge and to be challenged by the museum on several legal issues which were addressed in some works," Marketou said. "It has been a surprise to me how most of the cultural institutions in this country are not ready yet to host this sort of exhibition because of both the technical and controversial issues raised by the politics associated with some of these works." Art_Hack runs through June 30. Anyway, This is a refreshing exhibit. I like that it�s crowded in the basement. Makes the works feel vital. Every piece is a gem worth spending time with. And while I was at the opening; I was asked on the street last night about my comment "Free Speech Monkeys" pertaining to the thingist debate. This is what I mean: A free speech Monkey is someone who jumps up and down screeching "Free Speech" , "Free Speech". In order to drown out what other people are saying. The last effective use of this technique was during the Florida election recount when a group of paid young republicans staged a fake protest in front of TV cameras shouting "Let Us In" , "Let Us In" , to make it appear as if there was vote counting fraud occuring. i have to agree, the show was great. i really liked e8z�s carnivore client a lot (it reminded me of chris burden�s �medusa�s head�. josh davis� client is great too, but i�ve seen it bunches of times before. i thought the knowbotic research installation, though very cool, was relying a bit to heavily on those strobe lights for it�s coolness... it was a very aggressive installation which was impressive. also, the HUGE plasma screen in the window was a bit.. ostentatious maybe. it worked well as a foil to alex�s melting, goopy, deconstructed carnivore hardware and busted atari 2600 look of his client though. the hi-tech for lo-tech (phat plasma screen for lowly tv watching) vs. the lo-tech for hi-tech (exploded computer for cutting-edge new media art) worked well together. 'Open_Source_Art_Hack' � una mostra collettiva che si inaugura il 3 maggio alla Media Z Lounge del New Museum di Manhattan. Curata da Steve Dietz, Jenny Marketou e Anne Barlow si svolge in un lasso di tempo lungo (fino al 30 giugno, alternando eventi dal vivo all'esposizione sempre aperta. Vi partecipano i Knowbotic Research che collaborano al collettivo LAN, con l'installazione 'Tracenoizer', gi� premiata all'ultima edizione di Transmediale (vedi Transmediale02, go public!, festival di new media art a Berlino. ), creatrice di false home page basate su ricerche in rete, il supergruppo degli RSG con una delle applicazioni del software d'arte 'Carnivore', (vedi Carnivore Art. 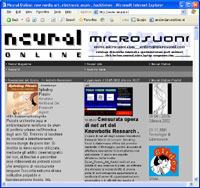 ), i neozelandesi Radioqualia con la loro Free Radio Linux (vedi Free Radio Linux.) e CueJack di Cue P. Doll, l'artista del collettivo rtmark che ha creato un software in grado di redirigere il lettore di codici a barre :Cue Cat non sul sito ufficiale dell'azienda rilevata, ma su altre pagine che forniscono informazioni alternative. Nuovi, invece, sono i lavori 'Anti-wargame' (nell'immagine), un videogioco programmato da Josh On dei Future Farmers, che sarcasticamente penalizza i giocatori con una coscienza sociale, 'Eye Machine' del berlinese Harun Farocki, che identifica le foto e le simulazioni al computer mostrate durante le news televisive relative alla Guerra del Golfo. Prevista anche una conferenza di Rena Tangens (Pretty Good Privacy) e performance dei Surveillance Camera Players che mostreranno tutti le telecamere di controllo del quartiere di Soho (New York), e dei danesi Superflex e Tenantspin per un broadcasting comunitario. "Museum's Hack Art Piece Pulled"